The mild weather we’ve been experiencing in Montreal has put me in the mood for salad. 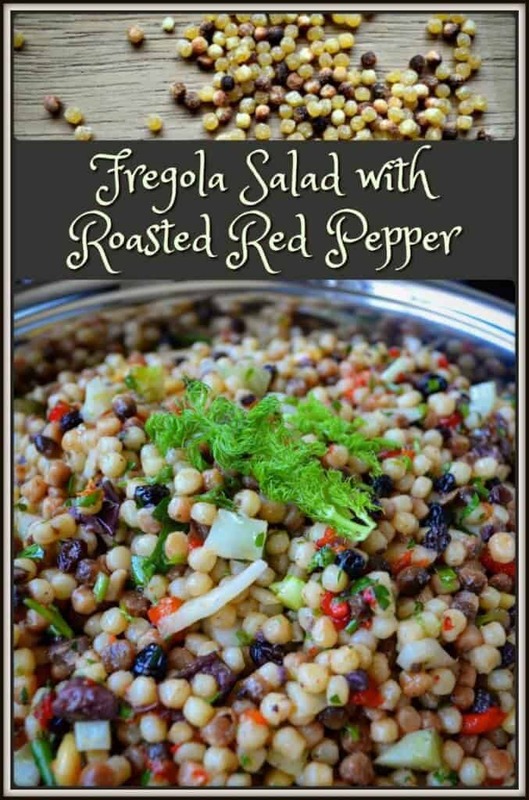 But not just any salad: a tasteful Fregola Salad with Roasted Red Pepper. As you can see, fregola look like tiny beads. These tiny beads have a wonderful nutty taste because they’ve been lightly toasted. 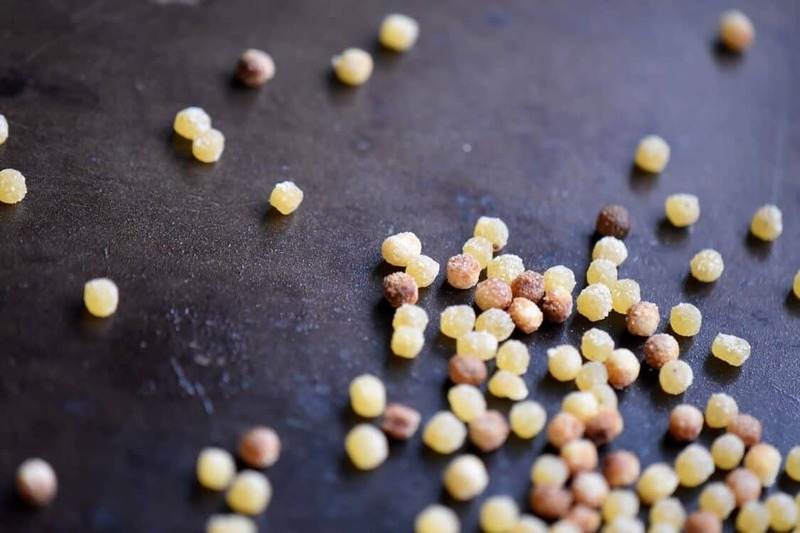 Originating from the south side of Sardinia (in Italy), fregola has often been compared to Israeli couscous. Sardinians will often prepare it with fresh clams and tomatoes. Thanks to its wonderful versatility and some very creative chefs, it can make an appearance in soups, as a side dish, or, my favorite, in salads. I’ve read that it is surprisingly easy to make your own fregola at home. The procedure basically consists of combining some coarse and fine semolina with a sprinkle of salted water. You then have to rub the mixture with your hands until the tiny beads are formed. Toast in the oven and there you have it: homemade fregola. I’ve never made my own fregola, but it’s on my to-do list (or, at least, on my to-attempt list). For now, I buy my fregola in an Italian specialty store (it is also available from Amazon). The combinations of simple ingredients like roasted red pepper and fennel along with the nuttiness of the fregola is a guaranteed winner. I also like to make this Fregola Spinach Pomegranate Winter Salad, who says you can’t have salads in the winter? As I previously mentioned in this post about soft amaretti cookies, I visited Sardinia about thirty years ago. 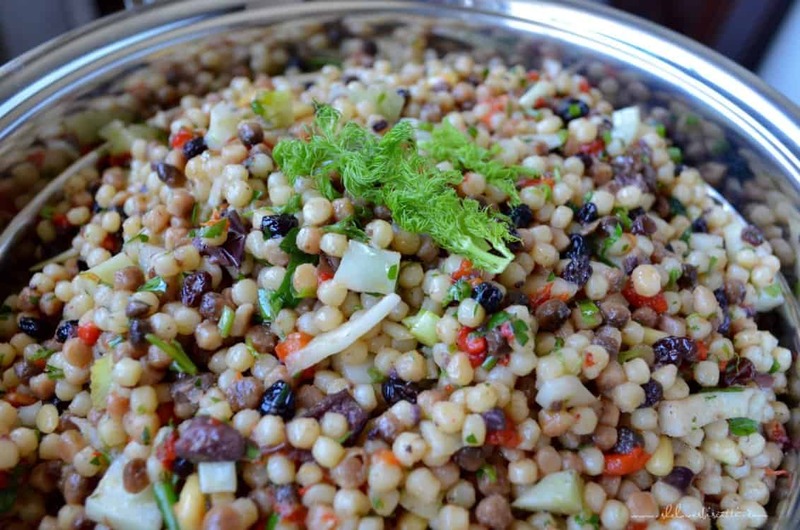 That was my introduction to the food of Sardinia, and I’ve been on the lookout for salads that incorporate fregola ever since. A couple of years ago, I came across a recipe in the Food Section of the Montreal Gazette, submitted by a Montreal chef named Michele Forgione. Thank-you, Chef Michele, for the best-tasting Fregola Salad with Roasted Red Pepper ever! I played around with the recipe to suit my tastes. What changes will you make to call it your own? Fregola Salad with Roasted Red Pepper -made with healthy and simple ingredients. Come discover what Sardinians have known for centuries. Bring a large pot of salted water to boil and add the fregola. Stir and cook for approximately 15 minutes or until al dente. Add the raisins during the last minute of cooking. In a large mixing bowl, whisk together olive oil and vinegar. Add the fregola, olives, fennel and herbs. Combine. Gently combine the pine nuts and the roasted red pepper. What a beautiful salad packed full of interesting flavours! I’ve been craving some serious salads and vegetables this week and always looking for fresh ideas. Thanks for sharing! This recipes looks so good and easy to make. I would have never of thought of putting raisins and olives together – I can’t wait to try it! Well…now I know what to do with that half bag of fregola sitting in my pantry! 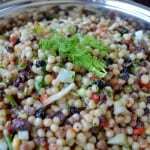 Love this salad idea, and thanks for setting the record straight…I’ve seen it called Israeli couscous so many times. Sounds like a fun experiment too, I might get my son involved as he loves learning about food. I’ve never heard of this before! I may have to go check out the Italian grocer as this looks like a pretty easy recipe once you have the fregola. What an enticing introduction to fregola! I certainly do want to try your salad. I might omit the raisins, but otherwise keep it the same. Can I use Israeli couscous if I can’t find fregola? It might be hard to track down in SK. Thank-you for your comment. 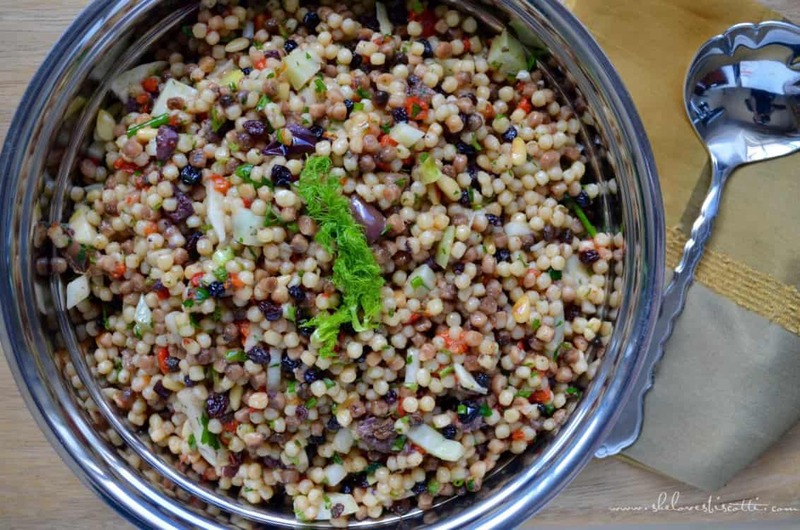 If I were to compare these two wonderful foods, I would say that fregola is more rustic and has a wonderful nutty flavour…that being said,I think you can absolutely substitute with Israeli couscous and create a slightly different but tasty salad. Let me know how it turns out.